Prime Minister Dr. Abdulaziz bin Habtoor on Wednesday discussed with Secretary-General of Local Council in Mahweet province Ali al-Zikum the humanitarian and services conditions in the province. 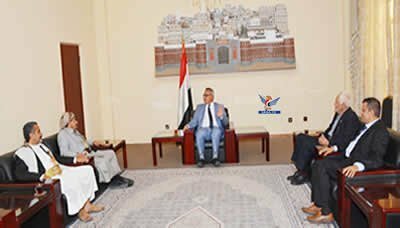 The meeting dealt with the province’s vital humanitarian and service requirements to alleviate the suffering of its residents due to the effects of Saudi-Emirati coalition and the siege imposed on the Yemeni people. Al-Zikum gave a brief presentation on the conditions in the province and the efforts being exerted by the local authority in coordination with the concerned ministries to face the major challenges related directly to the daily life of citizens. He indicated to the need to increase the presence of human activity in line with the magnitude of the humanitarian challenges experienced by the province, expressing his appreciation for the existing humanitarian interventions by several international humanitarian organizations, which had a positive role in alleviating the suffering of the citizens.